SportPesa Racing Point's driver Sergio Perez gives thumbs up after unveiling the new livery. 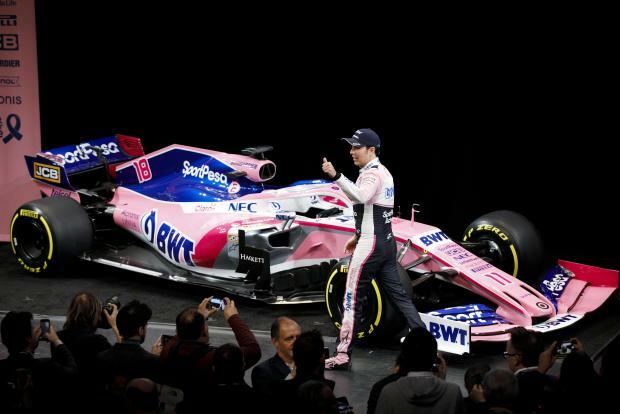 Racing Point unveiled its new look for the 2019 Formula One season on Wednesday, showing off a striking pink livery branded with the logo of African betting company Sportpesa. At a formal media presentation at the Canadian International Autoshow in Toronto, Racing Point's car was displayed alongside drivers Sergio Perez and Lance Stroll. The team was rebranded as Racing Point after a consortium led by Canadian billionaire Lawrence Stroll took over Force India last year ahead of the Belgian Grand Prix. Racing Point principal Otmar Szafnauer said the team was targeting a top four finish in the world championship this season after failing to make a podium in nine races last year. "The long-term aim is to take this team to the very top of the sport," Szafnauer said. "We want to be fighting for podiums on merit and aiming for a strong top four finish in the championship." Mexican driver Perez retained his drive after recording five podium finishes with the team in its Force India guise after joining in 2014. The 29-year-old said he hopes to benefit from the removal of the uncertainty surrounding the team's ownership. "We have stability and strong leadership at the top, which is important because it means I can simply focus on the driving and performance," he said. "I want us to be the best of the rest once again." Perez has a new team-mate however in Lance Stroll, the son of the team owner. Stroll joins from Williams after racing two seasons in Formula One which included a first podium in 2017 at the Azerbaijan Grand Prix. "I want us to be competitive right from the start," Stroll said. "It's way too early to know how we compare to the other teams, but right here today I believe we should be fighting for points in every race. "My goal is to get back on the podium in 2019 as well."